After wading through the throngs of concert-goers out into the open air of Nat Bailey, I had this nebulous feeling that Lilith Fair was going to be more than the sum of its parts. The atmosphere was ripe with what I assumed was a collective anticipation of the forthcoming performances, yet, too, there was a pervasive, cohesive force underfoot. Feminine energy perhaps? The significant all-generation presence of families and couples of every persuasion underscored this invisible sensation. This initial impression in place, I turned to catch about thirty seconds of Camille and Her Bratty Sister Saffron at the second, rear stage. Beautiful harmonies... now if we all could have got into the venue a little faster... sorry gals, next time. Next up at stage rear was the diminutive Holly McNarland, putting forth a captivating 20 minute acoustic set, performing seemingly very personal tunes that showcased both the melody and passion of her fabulous voice. With half the audience more concerned with getting seats at the front of the mainstage, Holly set the scene for the rest of the performances: highly personalised and essentials only. And so it was with the first mainstage performer, Michelle McAdorey. I half presumed she would perform with the same aloofness and detachment as she did with Crash Vegas. Not so. 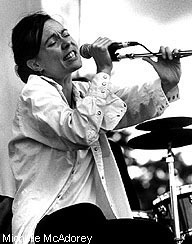 Performing potently expressive ballads, infused with her breathy wispy voice, Michelle painted decidedly Canadian images. "Lost in Algonquin Park" struck a chord with many in the audience, and then she set us all on our ear with something even she described as just "weird": a from-the-guts, spoken-word ramble set to a wall of noise sounding not unlike a hulking behemoth of a diesel train engine, bearing down and squashing us all into our seats. 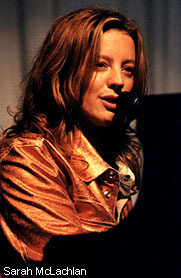 Yet from that dark place, Michelle left us looking for more, raising the intensity for the next performer, New York-based Paula Cole. This former jazz singer was a standout this day. Continuing on with the personal feel of the event, Paula explained what was near and dear to her about each song. Starting her set with an emotional and slightly jazzy piano biased song, "Happy Home," she alluded to a perhaps tumultuous relationship with her own mother. Paula's incredible vocal range punctured our minds and affected a quirky, soul-baring style creating a magical connection to her contemporary and energetic music. You felt her fire, you felt her joy. Paula led us all down the garden path of relationships and self. Finishing off with the most original rendition of Dolly Parton's "Jolene" that I've ever heard, Paula managed to completely belie this song's country origins. Pouring into it, she finished the song with an intense hip-hop dance routine, the final seconds of which had Paula banging on a bass drum. Unexpected, strong and beautiful, Paula left the stage amid a standing ovation, which left the next songstress, Lisa Loeb, with the daunting task of capturing the crowd from this fervent high.. Slipping out with nary a whisper, Lisa wasn't immediately noticed above the din of the crowd, but nonetheless she grabbed everyone's attention with a sharp "Hello! ", sending everyone scrambling back to their seats. This pink cotton candy voiced Texan appeared alone onstage with a solitary acoustic guitar. Soft, quiet and introspective was her set. Gradually she garnered more and more of the audience's attention, particularly after performing her single "Stay (I Miss You)," which seemed to finally lock everyone in. 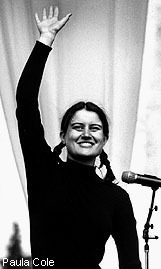 While Lisa's music didn't come across as being particularly unique or diverse, it had a certain melodic charm. 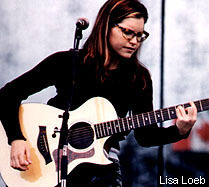 Perhaps a segue from the intensely impassioned to the fluidly graceful, Lisa Loeb somehow managed to glue it all together with that omnipresent feminine energy. 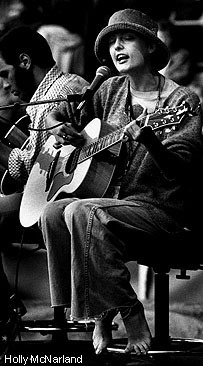 Next up, Emmylou Harris, a performer who to me seems to have been around forever but who never seems to look any older. Very hip in a black miniskirt and boots, Emmylou put forth an impeccable performance which criss-crossed the roadmap of musical genres. 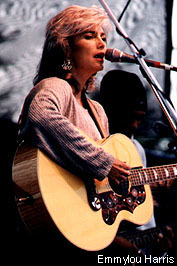 Emmylou performed personal favourites from the likes of Daniel Lanois, Nick Lowe and even Steve Earle. Her voiced flowed through the lyrics in a way that made me imagine floating over softly undulating fields of grain just before harvest, her vocals occasionally earthy and hoarse in a Stevie Nicks kind of way. A touch folky, with contemporary flair and a hint of country twang, Emmylou's performance glided by with polish and energy. Unfortunately, all this didn't seem to fully captivate the audience whose musical appetites seemed to grow ever more impatient for the "goddess" of Lilith Fair, Sarah McLachlan. When the setting sun gave rise to golden halos around the gloomy leftover storm clouds not so high above us, the woman behind this afternoon's celebration of female performers finally appeared. With a collective roar at the first glimpse of her, the crowd was up on its feet and almost immediately spellbound as Sarah McLachlan ever so humbly took to her piano to perform the first tune of her set, "Full of Grace." Speaking to everyone in the crowd (by now in full scream mode) like they were guests in her own home, Sarah explained how personally important this festival was to her and emphasized just how much fun it was for the performers, too, as they could let their hair down a bit compared to a regular show. Then Sarah took us on a transcendent journey with her ethereal vocal talents, up over those clouds into some kind of musical heaven. She performed primarily newer material, including "Wait," "I Will Remember You" and "Terms of Endearment," and a light-hearted attempt at Oasis' "Wonderwall" led the crowd to storm up to the stage faster than any stiff-jawed security crew could mount a serious defense. All hair was let down after that and the whole thing turned into some kind of love-in. With fans continuously crawling up onstage to hug Sarah and even give her flowers, Ms. McLachlan had quite an emotional effect on all present. A quiet rendering of Joni Mitchell's "Blue" with additional vocal backup by Paula Cole and a soul-stirring version of "Mary" for the first and second encores were all it took to make this exquisite performance complete. Indeed the goddesses, if not Lilith herself, smiled upon us today.